2019 marks our 27th annual conference, so you’re invited to join us for a chance to learn more about the craft and business of writing as well as a chance to meet with editors and agents. The dates: May 3-5, 2019. The prequel: May 2, 2019. Regular registration is available from November 16, 2018 through April 7, 2019 for $415. Late registration is available from April 8, 2019 through April 28, 2019 for $485. After this point, we cannot guarantee space, but will attempt to accommodate latecomers based on any cancellations received during this time. The earlier you register, the better your chance of getting your first choice for Read & Critique and/or Query appointments. Pikes Peak Writers Conference has a welcoming, friendly atmosphere filled with the topics that interest you the most, and perhaps a few topics that you will become interested in after. You will be surrounded by industry professionals and other dreamers who are eager to learn, connect and network. 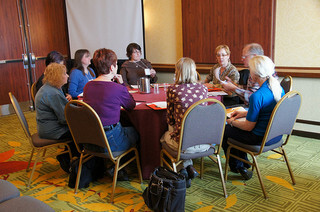 Our three-day conference is full of in-depth workshops, best-selling keynote speakers, opportunities for one-on-one time with agents and editors, the chance to read your work aloud for constructive critique, and the opportunity to socialize with fellow writers while building your network. Your conference registration fee includes Friday’s welcome lunch and dinner, Saturday’s continental breakfast, keynote luncheon and The Zebulon Awards banquet, and Sunday’s continental breakfast and farewell luncheon. Additional Saturday Zebulon Banquet tickets are available to purchase for spouses and guests. Faculty members will host lunch and dinner tables so you have the opportunity to chat with that editor, agent, or author you’ve been dying to meet. The exceptional keynote speakers will make each meal an unforgettable experience. We are pleased to announce that our longtime partner, the Colorado Springs Marriott, has agreed to the discounted room price of $115/night for the 2019 conference. Please make your reservation at the Colorado Springs Marriott website or by calling 719-260-1800 by April 1, 2019 and remember to tell them you are with PPWC to get the discounted price. The discounted room rate is not guaranteed after this date. Who wants to help us gear up for the 2019 Pikes Peak Writers Conference? The open session with Sourcebooks editor, Deb Werksman, entitled Stitch, Pitch and Color will still be held on Thursday evening in the Ascent Library. However, the time has changed to 5:00 – 6:00 p.m. Bring your knitting, coloring books and questions and join Deb for an informal, friendly session of crafts and answers. PPWC brings you a diverse line-up of workshops to attend. You can choose from workshops on craft, genre, queries, proposals, marketing, e-books, self-publishing, and more. There are workshops for writers at every stage of their career. Dying to get your manuscript in front of an editor or agent? Sign-up for a Read & Critique or Query 1-on-1 appointment, and you may have that chance. Editors and agents will be on hand to read your query or to give you feedback on your writing.